Chikubwa starts her 22-seater Mercedes Benz sprinter heading for Chiredzi as early as 04:45 hrs but she first makes quick errands to town, Mucheke and Rujeko suburbs picking up her passengers who would have made prior bookings. She then makes a brief stop at Exor filling station to fill up her bus and by 05:30 hrs, she departs for Chiredzi. 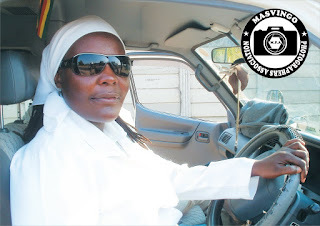 Inspired by four of her brothers who are in haulage trucking, Chikubwa says she has never looked back and is encouraged by the fact that most women who are professional drivers are excelling in their work and have gained their customers' confidence. Known affectionately as Mai Nyan'a on her route, Chikubwa is a mother of two daughters and she acquired her driver's licence in 1998. She holds a class 2 driver's licence which qualifies her to drive haulage trucks but is comfortable with the 2- seater bus which she says allows her to spend more time with her family. "Men always say a lot about women drivers, how they act on impulse on the road and their poor reversing and parking skills. "Every trip has its own type of new male passengers on board but I can handle anything. I have also had cases whereby passengers disembark and give me compliments….they know we ladies don't use drugs and alcohol so they trust me more. All being equal, I complete my 406 km trip to and from Chiredzi by 13:30 so I prepare my vehicle for the next day. If there are no issues with the trailer or wheels, I park the vehicle at 14:30 hrs and spend the rest of the day with my family.